Rumors have been swirling for several weeks about the possibility that Jorge Lorenzo, last years MotoGP world champion, might ditch the best bike in the paddock for a huge payday and the chance to finally prove he’s better than Rossi. Now, those rumors are looking like a reality. I know, when I first heard the rumors I thought they were crazy too. The Yamaha is the best bike in the paddock and it fits Lorenzo’s riding style well. Why on Earth would he want to leave that? Certainly the tension between he and Rossi can’t be that bad. Last month, news came out that Rossi signed a new, two-year contract with Yamaha, which will likely be the last of his career. Several weeks before that, Bradley Smith signed with the KTM for their new MotoGP entry for next year. These moves left Lorenzo and Marquez as the two big names with contracts ending at the end of this year. 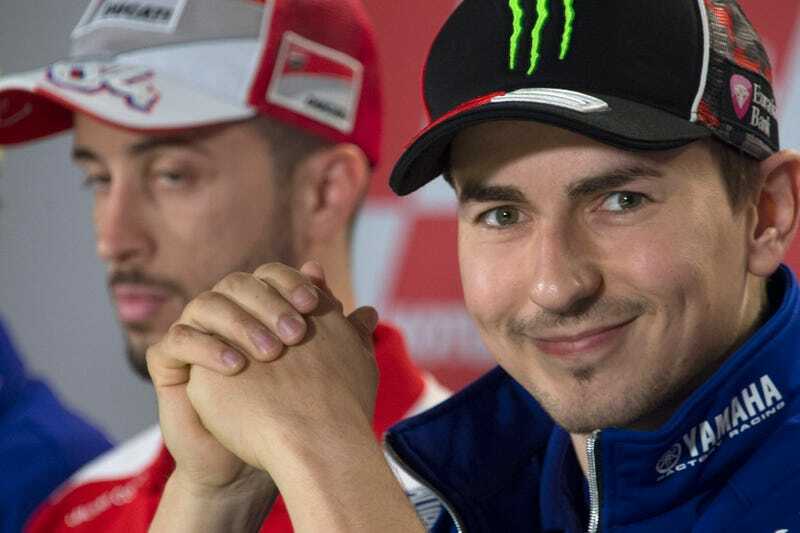 Lorenzo has stated several times that he’d planned to always be a Yamaha rider, which was part of why it raised eyebrows when he didn’t sign his contract when it was sent to him the same time Rossi received his. Then famed GP racer and 15-time world championh Giacomo Agostini made statements, claiming that Ducati made Lorenzo a “super offer.” Agostini isn’t just some guy, either. He has huge ties to Yamaha, and the company still trots him out for potential sponsors. If he’s saying it, there’s a big likelihood that it’s true. Rossi, helpful fellow that he is, decided to do the opposite of staying out of the matter by claiming that Lorenzo “didn’t have the balls” to make a switch to Ducati. Two things: legacy and money. Some reports put Ducati’s offer to Lorenzo in the €11 million range while others have it as high as €20 million. But, and some argue more importantly, a move to Ducati is the only way to prove Lorenzo really is one of the best in history. Rossi couldn’t win on the Ducati, which means winning on it will finally elevate Lorenzo’s name beside the famous Italian. There are now several rumors that the deal has already been signed, and MCN.com is reporting that they too can confirm a deal is done. They’re reporting the deal will be announced in a few weeks when GP returns to Jerez. The current Desmosedici GP bike is the best it’s ever been, and is certainly the fastest in a straight line. Jorge could do really well on it, or at least not crash into his teammate when in second and third place in the last corner of the last lap.